Hey, everyone! I’m one scene away from finishing book five in my Whispers Series. Squeee!!! Sorry I haven’t been around much. Now you know why.Expect book five, Sophie’s Secret Crush, out in May. 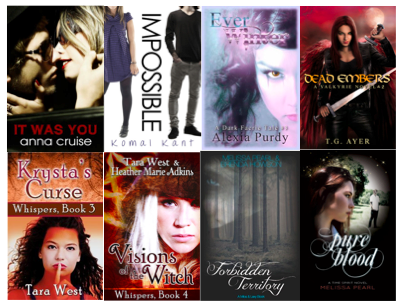 In the meantime, YA licious is giving away several book download prize packs. 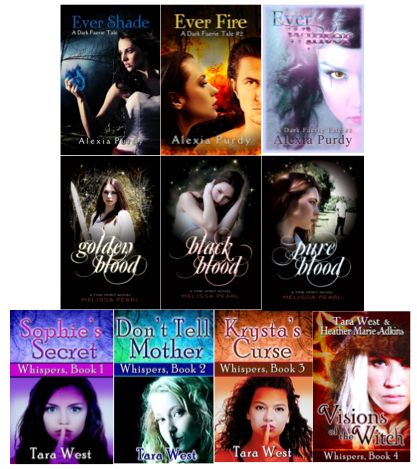 My Whispers series is included. Enter HERE for your chance to win one of several great prizes! Categories: books, news | Tags: Alexia Purdy, anna cruise, book giveaway, cambria hebert, Free books, Komal Kant, melissa pearl, prize pack giveaway, t.g. ayer, tara west, YAlicious | Permalink. Curse of the Ice Dragon book review tour and giveaway! Hey, big thanks to Goddess Fish Promotions for my book review tour this week. 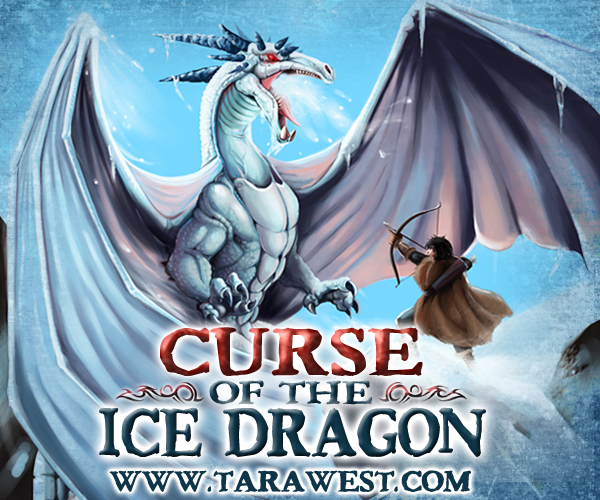 Every day through Saturday, Curse of the Ice Dragon will have a new blog stop and review. Stop by and comment for your chance to win a free download of one of my books. I’ll give away one ebook download each day. One lucky random winner will receive a $25 Amazon gift card at the end of the tour. Here’s the blog lineup. The more you enter, the more chances you have to win! And guess what? Even if you don’t win a download, the book is marked down to .99 on Amazon this week, too. Click here to purchase. Categories: books, news | Tags: book review, book review tour, books in the hall, Curse of the Ice Dragon, goddess fish, journey of a bookseller, lindsay's scribblings, long and short of it reviews, shelley's book case, tara west, voicu mihnea simandan | Permalink. Download Troll or Derby on Kindle, Nook, iTunes, Smashwords and Kobo. Debra Wheeler seems like any other high school reject: at fifteen, she’s more into roller skating than boys, and Mom plays favorites with big sister Gennifer, the homecoming princess. With little to love in ultra-rural Bedrock, Indiana, Deb’s counting down the days until she can skate away to join the roller derby. When Gennifer is kidnapped, Mom’s breakdown forces Deb to take charge. With no clue where to start and thugs on her tail, she turns to the only adult who has ever helped her out in a jam: Coach, the owner of the skating rink. So what if he has tusks and might be a troll? Coach gives her a pair of magical skates and sends her off into a world that reveals a magical, if somewhat sinister, nature. Deb soon discovers that beneath the “glamours” of everyday life flit a million fantastical stories–and her own might be the juiciest gossip in town. The Midwestern lifestyle every teenager loves to hate is turned inside out as Deb careens through Rumspringa, biker gangs, flea markets and tractor pulls–all teeming with fae. The valiant troll Harlow tries to intervene before Deb strays from her mission into romance and roller derby, but will they join forces to save Gennifer, or be lost to this strange new realm, forever? Readers will find Deb a smart and witty narrator who–like them–says the wrong thing, wishes she could be someone else, and falls for the wrong person. They’ll be drawn in by a girl who is independent and street smart, and they’ll fall for her destined BFF, the whimsical troll loner who guides them through this quirky dark fantasy romp. 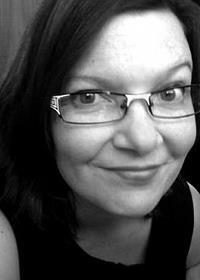 Red Tash is a journalist-turned-novelist of dark fantasy for readers of all ages. Monsters, SciFi, wizards, trolls, fairies, and roller derby lightly sautéed in a Southern/Midwestern sauce await you in her pantry of readerly delights. Y’all come, anytime. Categories: books, news | Tags: dark fantasy, Fae, fairy, fantasy, magic, new adult, paranormal, red tash, roller derby, sophie's secret, spring sale, tara west, troll, troll or derby, whispers, ya | Permalink. Hey, readers! Here’s your chance to enter to win a HUGE ebook giveaway featuring my books and many other awesome YA reads. CLICK HERE TO GO TO SARAH BILLINGTON’S BLOG AND ENTER! Due to the upcoming release of the second book in the series, The Kiss Off has a brand new cover! Isn’t it pretty? Scroll down some more and you’ll find the cover for Over It (The Kiss Off 2). Scroll down even FURTHER and find the 22 EBOOK WINNER TAKES ALL giveaway! Teen Youtube song writing sensation Poppy Douglas’s lead singer boyfriend Ty’s been criss-crossing the country and living it up on tour for months while Poppy has been stuck in the boring suburbs, finishing out the school year.But it’s Summer now, and the best thing just happened: Poppy’s royalties for writing the hit song The Kiss Off just came in. She’s minted, and she knows just what she’s going to blow it on.Ty’s band Academy of Lies are headlining a summer music festival, and Poppy is taking her girlfriends along for the best weekend of their lives. It’s all organized: the weekend is going to be full of camping under the stars, backstage passes, VIP rooms and partying like rock stars, not to mention some long awaited one-on-one time with America’s favorite front man.Except, when someone drops out of the trip and Poppy takes the opportunity to mend a broken friendship, it doesn’t quite go according to plan. And when she meets her boyfriend’s BFF from another band, the paparazzi form their own totally wrong conclusions. There’s also the matter of Ty’s ‘super fan’ stalker, but the less said about her the better. The biggest test of all comes in the form of an opportunity too good to pass up. But will insecurities and jealousy stand in Poppy’s way? Can Poppy and Ty’s relationship even survive it? 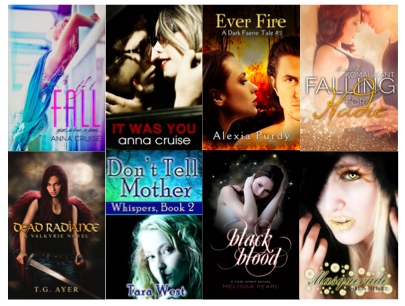 Categories: books, cover art, news | Tags: angela muse, angela pert, book giveaway, cj duggan, Fabio Bueno, greg james, Heather Adkins, Julia Crane, Lizzy Ford, Michelle Muto, Sarah Billington, tara west, the kiss off, veronica blade | Permalink. Lincoln was dressed in gym shorts and a white wife beater that stretched across his muscular chest and displayed his arms for the world to see. Obviously, the guy was confident about his body which just made him come across as arrogant and self-assured. The kind of guy I wanted nothing to do with. Was this guy dumb too? Lincoln ignored me and bent down on one knee so he was at eye-level with Halo. Halo began sniffing his shoes cautiously. I was kind of hoping he’d take a bite out of Lincoln’s face, but instead he began licking Lincoln’s outstretched hand. My dog was a complete traitor. “You are seriously messed up, you know that? My name is Hadie, not Hades, so stop calling me that.” I gave him my best glare. “Why are you so uppity?” Lincoln asked, drawing closer to me. I tapped a finger against my chin as if contemplating his question, even though I already knew the answer. He watched me in amusement, and, for some reason, it bothered me the way he was studying me. I stopped mid-sentence as a broad grin spread across Lincoln’s face. “You think I’m hot?” he asked, leaning in so close that I forgot to breathe. The way he was looking at me made my stomach flip backwards. For a moment, we just looked at each other, our breaths entangling in the cold air—neither of us said a word. Something unspoken was passing between us, making my heart thrum and my hands shake. Coming to my senses, I placed a hand on the center of his firm chest and pushed him back. When Lincoln was that close it made it hard to think. Lincoln’s smile faded and he actually looked hurt for a moment. He turned to the side, lost in thought. For a second, I couldn’t help but admire his profile—the strong jaw, the straight and narrow nose and the thick, dark lashes that stood out against his face. When he turned back to me, those azure eyes were on fire. The look in them was so scorching, so intense, that my knees went weak. It felt like the wind had been knocked out of me. No one had ever looked at me like that before. Lincoln tilted his head to the side. “Because you’re…” He trailed off, the words hanging in the air. It was amazing the affect Lincoln was having on me. I’d been adamant that I would stay away from him, that I wouldn’t get close to him, but he was making that increasingly difficult for me. The boy was definitely attractive and now I knew how Mariah had felt earlier on. “Look it up in the dictionary!” I snapped, and stormed back the way I’d come. Get Falling for Hadie on Amazon today! 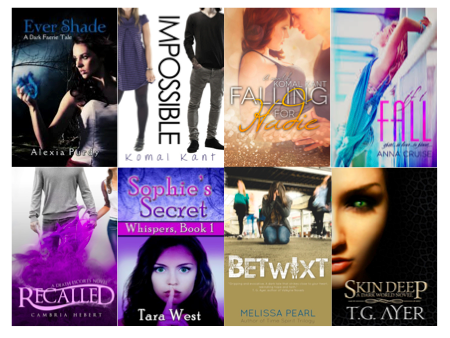 Categories: books, news | Tags: Falling for Hadie, Komal Kant, tara west, teen romance, YA romance | Permalink.